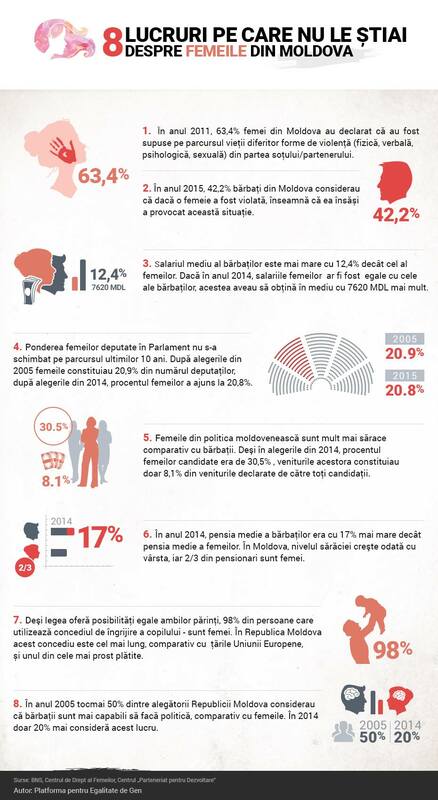 Platform for Gender Equality launched the infographic “8 things you did not know about women in Moldova”, so as to persuade authorities to go beyond congratulations, and assume a firm commitment to address the issues faced by women in Moldova. 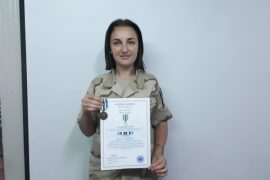 In 2011, 63.4% of Moldovan women said they had been subjected to various forms of violence (physical, verbal, psychological, sexual) from their husband or partner in their lifetime. 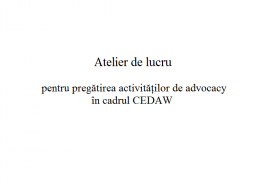 In 2015, 42.2% of Moldovan men believed that if a woman was raped, it means that she herself had caused the situation. The average salary for men is 12.4% higher than for women. In 2014, if women’s wages were to be equal to those of men, they had to earn an average of 7,620 MDL more. 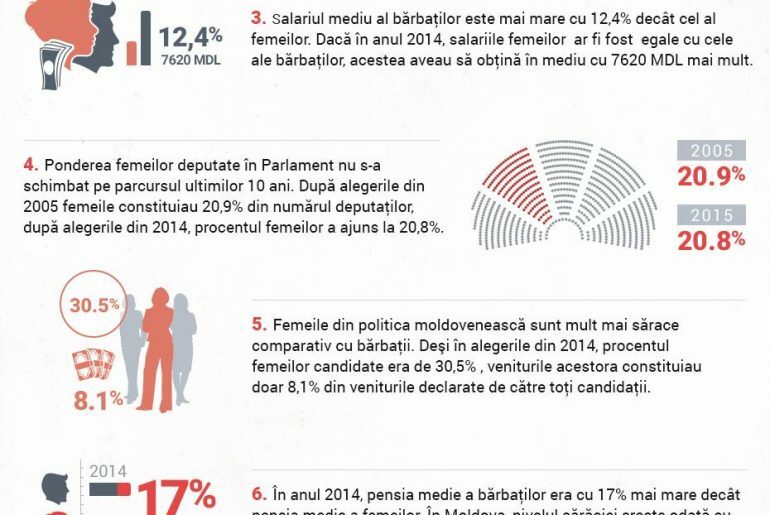 Women in Moldovan politics are much poorer than men. Even if in the 2014 elections the percentage of female candidates was 30.5%, their revenue constituted only 8.1% of the income declared by male candidates. In 2014, the average pension for men was 17% higher than the average pension for women. In Moldova, poverty increases with age, and two thirds of pensioners are women. Even if the law provides equal opportunities to both parents, 98% of people who use childcare leave are women. In Moldova, the duration of this leave is the longest compared to EU countries, and one of the most poorly paid. In 2005, just 50% of voters believed that Moldovan men are more capable of doing politics than women. In 2014 only 20% of respondents still consider this.